A few months back, Lynn and I took a vacation in the beautiful Smoky Mountains of North Carolina. Surprisingly enough, there were quite a few gyms/ fitness facilities in even the most remote of areas and small townships. Perfect! 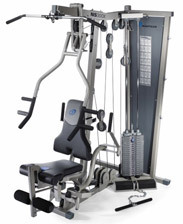 One of the gyms had a large advertisement billboard touting the newest line of "Muscle-Building Machines" that could now be found inside. Someone please HURRY, get the national news media and perhaps even contact all the major publications!--Can you believe it ??!! There are machines that will actually build muscle mass for you......Now this I've got to see.. Hmmm, now how does this work exactly? Does one merely look at them, or instead sit or lay upon these magical devices and voila! !--magically there you have it --a larger, stronger and more developed musculature. How amazingly simple is that? No lifeless machine nor piece of exercise equipment could possibly ever develop or enhance the human physique. Rather, instead, it is YOUR proper plan or training approach applied through and combined with YOUR volitional efforts, energy, focus, nutrition, genetic predisposition, recovery ability, etc. that allows one to witness an eventual increase in muscular size, strength, flexibility, vitality, endurance, etc. All that any equipment can possibly do, is allow you to exact your effort(s) through their implementation whenever you choose to show-up and use it. No machine, dumbbell or barbell builds muscle...YOU build/develop the muscle....or not. Wonder just how many people refusing to critically analyze that outrageous claim (that it's their "machines" that will build muscle for you) will rush to that facility and line up to receive a dose of that magic?